Above all, what is missing from the world is a sense of what is in operation as the world. We are in operation as the world, that is, our sense of measure. Knowing our sense of measure requires knowing the sensing mechanism and the limits it installs. Each mode of sensing is a convention of actions, a genre that tries to enforce a Totality. The number of genres possible are infinite. EXIT-genres explore the number of ways that are just becoming available to move from one genre to another. This essay attempts to find a practice of genres that is not determined by them. Perhaps the best way to understand this endeavour is to consider the essay, what it is trying to say and to a great extent how it is being said, as an infinite series searching for its limits. Typically, or to be more precise, conventionally we search for the limit of an infinite series within the series. We are deferred within the system to something else that is always already there. If we search for limits outside the scope of any infinite series, the complexity generated among systems, infinite in themselves, produces results that cannot be predicted. This is precisely the difference between pro-found and pro-finding, between genre and EXIT-genres. We utilise Totalities all the time, we have become good at producing them and attached to the convenience the always already provides. In fact every act, every belief, even every feeling already implies an entire universe that would correspond to it. The poet and theorist Don Byrd, observes that “we are now responsible for our feelings the way we were once responsible for our beliefs” (Byrd, 2001, manuscript). Byrd raises the stakes by bringing the ability to measure difference and the consequences of difference into smaller and smaller events of person. Even the least visible social spaces are tied to the Totalities. Totality binds an infinite series to limits within, without or between by fixing all possible relations into place. In contemporary thought, fixity has changed Totalities into intolerable conclusions. They are only intolerable because they cannot deliver on their promise: to represent infinite diversity. Therefore a Totality can only represent a single infinite series, and even then the edges of Totalities are always frayed and cannot hold. As a result Totalities are always already permeable, overlapping and provisional. To practice EXIT-genres does not mean to seek the abolition of genres, quite the opposite, they re-search 'the mechanism of meaning'1 or all that is available in the organism. This essay, like the totalities it tries to describe, will open one infinite series after another. Inevitably a moment will arise when a series delimits itself and marks a horizon on the world and all that is possible. All of our systems of interaction have a scale of measure that demarcates a horizon. Physical objects including texts and operating systems including reading participate with totality. For example, we become convinced that the sensation of the medium is the sensation of being as when language is substituted for being. In guarding against this conflation we must dissociate the hum of the mechanism from the sound it can reproduce2. It is important to consider the idea that, like our cars, we have constructed our totalities to breakdown. In the past through half of the twentieth century one Totality was replaced by another. Today we need to look at the mechanism that generates totalities and think in terms of the sustainability of our systems. The site of sustainability is located where the organism and the person interact. This site is the organisation of the organism. Through acts of reorganisation Totality can become tolerable again when it becomes multiple: totalities. It is in the organism of the organism that totalities can be used as modes of orientation for particular engagements with the world. A liminal space opens up between the inscription of culture and biological inscriptions. It is where contemporary persons find themselves. Biological inscriptions are the result of the genetic code we inherit, including dispositions we do not question and physiological tendencies we utilise when receiving and incorporating information. Cultural inscription either reinforces or redirects the biological towards the logic of the social. In other words, we are born into a situation where we constantly negotiate between our biology and our culture. The form this negotiation takes should have a name that indicates this interaction. The term organism-person3 is a constant reminder that we cannot be reduced to one or the other. Not only are there constant interactions within the organism-person but these interactions are part of a larger feedback loop, which includes the organism-person and the surroundings. A feedback loop is a model of interaction between a sensing, perceiving entity and its environment or surroundings. It does not matter if this entity is a protein based human or a silicon based computer, basically the information from the surround is acted upon by selecting responses and 'appropriate' changes. In humans as in some computers there are self-conscious systems in place that provide additional descriptions of all these processes. This makes the loop recursive and enables the entity to learn. Since feedback loops between organism-person and the surround include a point of self-consciousness (an internal description of internal and external descriptions), then we should understand organisation as the awareness of the entire system of possibilities currently configured in the organism and the untapped potential for other links and emergent configurations. When emergence is curtailed in favour of conservation it is due to the function called 'person' intervenes so that organisms can imagine themselves as separate or autonomous. Between organism and person, and person and surround, we find the complex activity of reading which acts as a common ground. Literacy is distinct from Reading, which involves the continuity of our sensing and perceiving organism is used to organise interaction with the world. Reading presents a situation where we may observe the activation of all the organism-person's awareness, experience and linking skills. Most importantly, reading occupies a space between, where connections or contentions in alignment of the organism and the person are played out. Therefore reading provides the opportunity to discuss what is involved in our negotiations, and will give us insight into how we go about developing a 'practice of person'. It is precisely because we cannot separate the processes of organism-person-surround that the middle term, the person, the self-conscious point of recursion, cannot be studied in isolation. It is at this point that we can talk about 'person' as a site of the organisation of the organism, where decisions of active compliance, or of intervention and inflection are initiated. EXIT-genres may arise only from approaches to the radical reorganisation of what we perceive to be given and takes up the challenge that Arakawa and Gins have set. EXIT-genres to re-open each event in the world. We must decide upon how we engage with conditions we experience as given and the conditions we deem changeable. Our interaction depends upon how we inform our decisions concerning the totalities that genres impose. What have genres been? The generic description of genre is a type, class, variety or category of art or literature distinguished by a definite style, form or content which is often related to the depiction of scenes or subjects. In contemporary conditions film provides the clearest example of a popular understanding of genre. This extends genre to include the relation of technique and medium to content form and style. The following considerations will lead us to a changed understanding by moving the notion of genre to the place in between the site of cultural interaction and the biological site of the organism. The re-considerations discussed here include those proposed by Jean-François Lyotard, Gilles Deleuze and Luce Irigaray. Lyotard's notion of genre from The Differend connects acts of presentation to the creation of a universe. Deleuze's notion of genre from The Fold brings genre into the realm of subjective activity by making thought and perception participants in the infinite difference of the world. Irigaray in “The Three Genres” brings the notion of genre directly to bear upon forms of subjectivity. Lyotard's discussion of genre in The Differend stays closest to a dictionary definition of genre except that he explicitly connects the activity to notions of Totality. He states that “For every phrase regimen, there corresponds a mode of presenting a universe, and one mode is not translatable into another” (Lyotard, 1988:128). Here modes of presenting are equivocated with genres built up form the smaller components of phrases and regimens of phrases. It is tempting to view regimens as genres however they do not operate as small universes but as categories within genre constructions. Lyotard continues, “A genre of discourse inspires a mode of linking phrases together, and these phrases can be from different regimens.” (Lyotard, 1988:128). He then poses the problem of how we might avoid the finality that a genre of discourse wants to impress upon the multiplicity of possibilities, since a genres' job is to “procure the success proper to that genre” (1988: 129). The incommensurability, of which Lyotard so often speaks, enters when it is not possible to separate the phrases within a genre from the kinds of links they carry with them. The nuance and complexity that Lyotard adds to the notion of genre revolves around the conflict that arises when the finality of genres coexists with endless possibilities of linking. The consequences of Lyotard's qualification of genre is the immediate connection between the set of conventions used to (re)present the world and the conditions that impose a worldview, world-order or Totality. These conditions are set into place because they are designed to be universal. The irony of worldviews is that they are necessarily posited from a particular point of view, which is specific, singular, and within historical and material time. Irigaray contributes another way to shift our notion of genre. She radically opens out the idea of genre by giving us a way to undo, suspend and possibly eliminate the barriers between regimens and between genres. In her essay “The Three Genres” she defines genres as “a style of amorous relations and a style of thought, exposition and writing” (Irigaray, 1991: 140). This ties together the corporeal, the affective, the social and the cultural. The affective is an important link here because it introduces criteria for linking that exists outside the regimes and discourses, which Lyotard describes as impermeable and final. The amorous affect places the process of linking back within the 'organism' rather than solely within the 'person'. It establishes a continuity external to the regime / genre / discourse because it is operating across modes of linking in the organism-person. On the smaller and smaller scales of interaction the connection between organism and person emerge more strongly and the conventions of genres are fractured into the micro-events of the attention, perception, noticing, and linking. On a biological level all these events have affect and effect upon the organism-person. Because Irigaray offers to us a way of paying attention to events that are not yet configured into the larger or figurative scale of regimes, we can find a source for linking outside the finality of regimes and genres. In other words the organism-person has its own sufficient reason for linking which are not included in the logic of linking inside regimens and genres. This last point is precisely where Deleuze's investigations are useful and offers the third shift in how we look at genre. In his book The Fold, Deleuze's supplies a close reading of Leibniz and the Baroque, however his phrasing and modes of linking are entirely contemporary, that is to say Leibniz after Deleuze. This is appropriate in our discussion of genre in relation to Deleuze's discussion of inclusion. His active reading is included in the world with which he engages. He is constructing a universe using the baroque modes of linking and a 'mannered' approach. The genres of inclusion are: auto-inclusion or things that are identical to themselves and can be infinite in form but remain isolated and without relation to each other. Reciprocal inclusion or things that enter into an infinite series of wholes and parts related by qualities that define them. Unilateral inclusions or converging series that tend towards limits and set the conditions for localisable combinations. The fourth genre of inclusion, unlocalisable unilateral inclusion, is of particular interest because its relates to a degree complexity where the amount of combinations and possibilities are so vast that the outcomes cannot be predicted. The limits of this form of inclusion therefore exist outside of any infinite series in a different realm organised by complex and unrelated modes of linking. In the language of Deleuze's book: this genre of inclusion, unlocalisable unilateral inclusion, is constantly unfolding (Deleuze, 1993: 48, 49, 57). It is the this last mode of inclusion that accesses different modes of sensing, perceiving, and presenting that the contemporary artists Arakawa and Gins have taken out of the books and put into the streets. Their theoretical practice as well as their art and architectural practice all work to make the 'reference guide' of possibilities all inclusive by using whatever procedures available, both within and across disciplines, to allow us to participate in the destiny of our own organism. Their work demonstrates how genres and other systems, once thought to be part of the world are in fact the form our participation with the world takes. Arakawa and Gins suggest that organism-persons operate across modes of sensing and therefore also across modes of presenting. The organism-person must constantly figure out the moment to moment goings-on, notice them, connect them and act upon them. They invented a particularly useful tool called landing sites to help us observe, learn and study the way in which body and surround enact each other (Arakawa and Gins, 2001 Architectural Body manuscript: 19 - 32). Landing sites involve all the organism-person's awareness as it relates to the surround, but also the sites that occurs across the imaginary divides of organism-person-surround-culture-history. The continuity produced by the organisation of the organism lies outside the logic of the regimes or genres themselves. All the events that constitute these configurations of landing sites are the result of procedures that allow us to connect them, and make available to us as modes of interaction (Arakawa and Gins, 2001: 57). The organism selects interactions based upon their actual affects and effects and not based upon any essential notion of their content or problems of translation. In Martin Jay's investigation of vision, Downcast Eyes, he supplies us with an example of the way cultures link modes of sensing with totality. Whereas Arakawa and gins show us how landing sites provide orientations for the singular organism-person, Jay observes how the orientation of cultures can be understood as the link between different configurations of landing sites. The implication of Gibson's argument is that vision is normally crossed with other senses but can be artificially separated out. Thus, cultures might be differentiated according to how the distinguish between visual field and visual world (Jay: 1994, p4). The point is that all the senses can be artificially separated out, or re-connected and reorganised. Cultures may also be distinguished by any mode of linking that associates or separates a mode of sensing form a totality or worldview. If we consider every disciplinary and discursive expression as stories of these links,4 then a great diversity emerges. Each story must be considered according to its modes of presentation (genre). Categorical differences are subsumed under a sea of nuance. The scale of events would be changed. We would be asked to attend to smaller differences, nuances and constituents elements. We would have to distinguish between stories that have physiological basis in the organism and stories that have a cultural basis. We find ourselves back at 'the mechanism of meaning' where an organism-person is able to realise living. It raises the question why would there only be three genres and not many, many more? There should be as many genres as there are modes of noticing, linking and presenting? The “reference guide to all that a person can possibly rally to the cause of being a person' would be increased by the radical proposal that each person is a mode of presenting a universe. Any line of escape would be a singular line, broken from generic party lines. We would be free to design freedom by linking link with any aspects of our person, especially aspects not yet claimed by generic modes of thought. That means the moment to moment, day to day, pragmatic integration of the complexity of the world cannot be provided in pre-fab or freeze-dried form, and cannot be preserved. EXIT genres are sets of interactions, migrations if you will, that constantly attempt to access other genres and move across modes of sensing, thinking, feeling and presenting. EXIT-genres provide continuity within movement. They attempt to disrupt the habitual, intervene in the institutional and organise the basis of our life. In the last twenty years we have seen an increasing uneasiness surfacing everywhere. It is an ethical unease triggered by a growing suspicion that our abstractions and our facility at manipulating forms are intimately connected with our ability to produce value. The paranoia is compounded by the inability of any single form of representation to adequately correspond to the complexity we experience5. EXIT-genres provide another ways of producing value, not based on historical premise or generic world orders. It puts value back in the hands of the organism-person. However EXIT-genres are always in danger of becoming genres. As soon as a strategy develops and a set of moves clicks into place a genre appears and persons hold onto the continuity they have manufactured. In this way an EXIT-genre must also escape itself, its own trap of self-identity and autonomy. How is this possible? No matter how innovative the unconventional a solution is or how critical, what was once a way of EXITing soon becomes a genre. Because part of the benefit of self-conscious feedback loops is the ability to produce and enforce imaginary systems which have real consequences. We are able to produce separation where none exists and certain links where none exists. We manage to do this because we are able to make our worldviews correspond to the most resistant aspects of the world. The more success we have corresponding the more likely we are to reinforce those behaviours. Historically we have become complacent even with our ability to exit. We have inherited two generic forms of EXIT. Two sizes have had to fit all persons: “out & away” and “in & through”. The first is the bigger and better known, “out and away”, a form of escape that dismantles or attempts to transcend its circumstances. To go out and away is to confront the formal aspect of genres and the rules that set the parameters for meaning, expectation, participation and innovation. The Modernist 'will' and its obsession to continually begin again exemplify this approach. Decisions about the form of the EXIT involve the strategies and practice of being a person. Decisions about the placement and use of EXITs involve ontological experiments of being in-person, in the organism-person. Therefore we should consider EXIT-genres to be dispositions and orientations, in short, modes of organisation. They seek to utilise unnoticed, untapped or underdeveloped relationships within established generic systems. This would include activities in the organism-person that cross between biological functions and subjective interactions. To EXIT, one would escape from conventional forms of exchange as well as habitual practices of thought. In this way we may think of EXIT-genres as genres of suggestion, the ability to make suggestions to one's own organism or as systems of directed attention. What initiates each direction of attention comes from outside the genre or genres7. Some suggestions will have a physiological basis and some will not. This is the difference between fantastic suggestions and practical ones. The alternatives to the imposing reason found within a genre are links that emerge from complexity. We are able to organise situations where we know something will emerge because we know the complex systems involved, but we cannot know the outcome. This enactive principle is not without its limits. We are now limited by the extent of our EXIT-genres, which initiates and researches the possibilities that arise from organism-person. The most useful sufficient reason for linking is 'amorous affection' supplied by Irigaray. The activity of 'reading' will be used to address the general perception that EXITs come in generic forms. EXIT-genres serve as an approach to reading, which emphasise richer and more varied sets of conditions. The aims are pragmatic and are focused not on 'getting out' but upon 'getting to' the next EXIT. It is therefore the different forms of 'going in and through' that we must look at, which requires a heightened attention to nuance. It is in the oscillation of our attention (and inattention) that makes something -- now a particle -- now a wave. As a result, successful escapes are no longer assessed on steady states or enduring qualities alone. Instead the world flickers with the acts of knowing. For example, we attend to or ignore certain qualities when interacting with a table and act upon its shape, material texture, seating capacity or ease to clean. This way of engaging with objects of our attention can be described as 'reading the world' and involves imposition (Totality) rather than inclusion as its model of interaction. Deleuze's discussion of modes of inclusion is useful when thinking about the configurations that emerge as the organism-person begins to read. EXIT-genres provide a way of linking Deleuze's modes of inclusion, where the reasons for the links fall outside the individual system or the entire configuration and can be found in amorous affections of subjectivity and its genres of organisation. At the beginning of a chapter entitled “Sufficient Reason” Deleuze describes the path from inflection to inclusion. He is describing the move from an initial action to the Totality invoked by that action. By examining what happens when we read, we become aware of the universe from which we draw our decisions. The choices we make literally form wholeness or fragmentation, continuity or tonality and installs them as “what is in operation as the world”. In order to demonstrate the implications of the complex practice of person, we will take the permutations of Reading and Experience one at a time. First the Reading of Experience, second the Experience of Reading, and third the Threshold Between a liminal space defined by limits of the found within the intersecting systems. In the conclusion of the essay, we must construct the possibility of EXIT-genres by re-reading and reconsidering what can be learned and acted upon from the point of view of the organism. Reading the world is a notion we are already acquainted with; it is organisational and ideological. It receives all the publicity and promotion. The Reading of experience proposes a conventionalised transparency between the symbolic order, the faculty of understanding, and events in the world. We accept, partly for convenience, that the symbolic order of language can represent the world and our experience. We “read” the world as a way of negotiating and managing it. By attending to the correspondence between Language and the world we are able to produce an understanding of all kinds of phenomena: the road, the river, our partner's expression, etc. The flow of information conforms easily to the acceleration and simulacra of which we have been convinced. Language underwrites the value of Reading because what it lacks in diversity of material it makes up for in the always already infinite internal variety. In other words the symbolic order of Reading is a bad infinity, a closed system dependant on itself for the production of meaning. An example of the Reading of Experience and its infinite regress is the Claude glass. The 17th century landscape paintings of Claude Lorraine were so remarkable for their ability to re-create the effects of light that a fashion was started. On daily walks through the countryside you would arrive at a beautiful vista, take out your Claude glass, a handheld blue mirror, turn your back to the scene and view it through the portable artist's vision. This is a clear instance of an activity that began as an inflected observation in painting and became a system of inclusion for reading other things in the world. A soon as the system of reading was extracted from the object and activity of painting, it could be reproduced and projection. It became a genre of activity celebrated for the way in which it offered itself as artifice and artefact to a particular organisation of the world. The Claude glass, an analog of a layer of glaze in oil painting, overlays or overwrites Reading and thereby organises any Experience had from that Reading. Some experiences, events, and sensations are more readily translated into symbolic systems than others. Discrepancies between experience of and experience in different media and genres raise questions as to the range of experience that symbolic order can manage to appropriately represent. A person engaged in several systems at once may need to draw upon other orders in the configuration. The phantom limb is one example that has received much discussion. Another more common experience is daydreaming while driving. A person is able to experience and read the dream while experiencing and reading the road. Handling the car negotiates cognitive, perceptual, proprioceptive and emotional response. The resulting events are determined by our attention and interest. Whether I 'see' or 'read' depends upon which genre of organism-person claims the activity. Whether I crash or not depends upon an EXIT-genre that allows creative use of the formal and material systems involved. Ultimately, a theory of EXIT-genres argues that awareness of the sensation of thought is a crucial factor in the decisions and experience that enriches us with possibilities while we remain safe drivers. Lyotard's essay “After the Sublime, the State of Aesthetics” offers a line of reasoning and line of escape from the Reading of Experience to the Experience of Reading, from Totality to the sensation of thought. We arrive with him at the sensation of thought by using an embodied model instead of an information model to deal with the problem of form and matter. For example a protein based intelligence will make different embodied choices and focus upon different aspects of the feedback loop in relation to its surround than a silicon based intelligence. Furthermore the medium of digitalisation cannot account for these embodied differences. As Lyotard anticipates, digitalisation preselects form over matter. In doing so the nuance of material is erased and replaced by a value of standardisation, which effects the range of experiences digital modes can offer to embodied minds. The aim of Lyotard's essay is not revealed until the last pages, where he asks, “Can we find an analogue of matter in the order of thought itself?”(Lyotard, The Inhuman, 1991: 142) He arrives there because he sees the signs of a disaster; a history played out between the presence of matter and the idea of form. He takes us through a set of “rapid considerations” in which the historical engagement with matter and form becomes an individual engagement with the sensation of words in thought. It is important at this point to provide a summary of Lyotard's essay on the question of matter and its importance to an understanding of the Experience of Reading. His “rapid considerations” already operate close to the aims of EXIT-genres as he moves across many forms and objects of discussion in a comprehensive manner. He is able to collapse major movement in the history of ideas to distil his argument. The summary offered here is tied to the various triggers, which Lyotard so skilfully deploys. The task is not to escape or critique Lyotard but to form a line of escape into what he might offer. It is also crucial to note (and somewhat ironic) that the disaster Lyotard perceives is tremendous value to EXIT-genres. The collapse of the sublime into the smallest sparks of matter is the celebration EXIT-genres makes of the inseparability of the organisms from the person and the person from the surround. Lyotard comments that Kant secures the purity of aesthetic pleasure by keeping aesthetics indifferent to material qualities regardless of whether they relate sensory or imaginative data. Form may be defined by considering thought as an act of giving a figure to matter and represents a property of mind common to all, ”its capacity (power, faculty) to synthesise data” (Lyotard, 1991: 138). Form is mind over matter. This Totality has taken a long time to construct and a long time to take hold. Part of the power of Kant's mode of presenting a universe is its rigour and apparent Totality. Even though he continued to work and break down the system he could not get to become a Totality (in his last unpublished manuscript Opus Postumum) his work nevertheless functions as a Total system. It is the decline of the 'natural fit' between matter and form that accentuates the break-up of the imagination and its relevance to the sublime sentiment. From this point onward we can only approach matter, “which means approaching presence without recourse to the means of presentation” (Lyotard, 1991: 139). “This heralds the end of aesthetics, that of the beautiful, in the name of the final destination of the mind, which is freedom” (Lyotard, 1991: 137). Freedom is provided at the expense of imagination and experiences the imagination is no longer free to present. We now need to interject and consider Lyotard's suggestions from the point of view of EXIT-genres. Lyotard has not acknowledged possibilities that would come from the organism. This would require an expanded notion of mind, which biology has currently given, that the body-mind consists of all neurological activity. The 'organism' does not withdraw from matter, from the Thing, however the history of aesthetic theory, the 'person' in search of beauty has amplified this withdrawal in order to concern itself with the mind and the creation of forms. Lyotard notes that what the logical structure of form ignores is any measure that “quasi-perceives” nuance. Nuance is the key to matter and the thread that undoes the formulations of form. The examples Lyotard uses are sound and colour, music and painting. The form of a sound consists of its measure in frequency, vibration, pitch, etc. What escapes is the nuance of timbre. For example the same note on different instruments, the same colour in pastel or watercolour. (Lyotard, 1991: 139, 140) Timbre and nuance “introduce a sort of infinity”, an indeterminacy and even an immaterial quality of material! Again Lyotard seems to be limiting the mind to its reflective functions, and does not register that it the embodied mind that notices nuance and timbre. He goes on to suggest that there is a state of mind… “a mindless state of mind, which is required of the mind not for matter to be perceived or conceived, given or grasped, but so that there be something” (Lyotard, 1991: 140). It is in this way that matter withdraws. What matter requires the mind to do when confronted with nuance and infinity -- is not to stop activity -- but to suspend the modes of linking which overwrite the experience. The other option is to remain open to the undifferentiated state of the world. Shy of this openness, there is still a gap between what is presentable and what is perceptible and not yet intelligible. If we now return to Lyotard's question “Can we find an analogue of matter in the order of thought? We find that the complicated path lead us to the sublime. The sublime is no longer possible because it has entered the material world; it was unable to remain outside the world as an idea. The disaster is that is has come down out of the dictionary and into the streets or more exactly into the material working of the organism itself. It is in the words, which are the matter of thought that the vestiges of the sublime can be located (Lyotard, 1991: 142). Words are the touch and rub of thought. The sensation of presentation is something that the imagination did not imagine. It is there to be felt, perceived and given a nuance of its own. “How can the mind situate itself with something that withdraws from every relationship?” By 'something' he means matter and the infinity opened by nuance. Matter only withdraws from symbolic relationships and from presentation by an imagination sacrificed to reason. The relation of the imagination to conceptual schemas of forming matter allow us to use genres otherwise, as temporary intolerable figurations of shared meaning and interest. EXIT-genres represent an approach to the configuration of forming actions. The organism-person is able to notice and utilise the sensation of thought. It provides a way to differentiate between the sensation a regime or genre of thought produces from the sensation a genre represents. EXIT-genres would allow the sensation of thought to enter back into an aesthetic theory that does not cauterise the quality of materials from forms and the activity of forming. This locates a sensation proper to the activity of thought, which nuance expands in our understanding. Different thoughts are literally of different matters. This indeterminable little bit is the difference between the mind/body split and the irreducible organism-person. The extrapolation of Lyotard's observation, that words are the matter of thought, would allow genres to become modes of producing sensation and EXIT-genres to become modes of linking sensation. The attention to nuance in the material dimension of thought is the Experience of Reading and joins with the contents of any mode of presentation to become possible points of view for the organism-person. Because the sensation of thought is near the threshold of imperceptibility it interferes with symbolic order by presenting thoughts that do not correspond with those in the symbolic order. Therefore we tend to ignore these new thoughts, assigning them the place of noise instead of regarding them as a regime of possible experience. Experience of reading is the sensation and perception of writing and reading rather than a sensation provided in writing and reading. It is nuance that allows us to differentiate between the Experience of Reading, (which is thought aware of the sensation of thought) and the Reading of Experience, (which is the transparency of symbolic form that separates form and matter into layers of information). The contemporary moment is marked by attempts to move between these states. 'The structure of the world is not the logic of language but the meaning of language'. (Byrd: 1994 p.28) The relationship of the imaginary to the symbolic, which is sacrificed in Lyotard's sublime, is precisely from where innovation stems. It is the site where re-configuration occurs and topples the grand narrative we have written for the 'organism' and the 'person'. EXIT-genres are concerned more with the events of configuration than with the standardisation of description. We ignore the fact that there is no escape from the present, not even for concepts thought to be a-historical or universal. Rarely do persons comply with one orientation or the other. The best example of a body–person on the threshold discoursing (running back and forth) between the Reading of Experience and the Experience of Reading, between the romance of total transparency and the intense involvement with emergence is Franz Kamin. In his book Scribble Death he constructs a threshold and names its affect ”AUTOSKREELIK”. He is there in-person on the threshold forming and sensing, sensing form and forming matter. His concepts have palpable dross attached to them and his words carry the fictive certainty of a world behind them. He is caught? Positionality is crucial here, as Kamin enacts the “never anywhere dwelling” that Heidegger associated with curiosity, or the “straying” abject quality of that Kristeva sees at the heart of identity, or the “tarrying” that Zizek attributes to the subject's use of the negative. All these moving positions describe the threshold of exits within exits, “even without moving” as Kafka's Ape says. It is here that most of us pace somewhere between abstractly structured forms of suggestion and concrete species of practice. Any conclusion that follows from these investigations must now do what has been described as EXIT-genres. This cannot be done from the point of view of language alone. We must now allow the Experience of Reading and EXIT-genres to come together. We must go outside the limits of language where a practice must ensue. The literal organism-person must be activated in all its interactions: physical, symbolic, imaginary and in between. This is the way out of (or in and through) the problem of being caught in the 'Threshold Between', using old genres and new sensations without a way to organise them. EXIT-genres allows us to employ what we have learned from our material organism-person. We must put ourselves back into the world and use our sensing and perceiving of bodily orientation in conjunction with our ability to read the world. The link between language as Totality and Perspective as Totality comes together in the notion of the 'text'. The text, like painting, is a cultural site where the cultural and the biological negotiate an orientation. The text no less than Reading makes us complicit with the relationship of body to a totality. This is the same strategy employed by visual images which make us think we have created what we have only perceived or which makes us believe we are in control of a scene we are only observing. From our previous discussions of the Reading of Experience, the Experience of Reading and the Threshold Between it is possible to locate orientations, links between biology and culture at the site of the organism-person that “operate as the world”. Figure 1. shows a diagram originally published in Lissitzky's essay “A. 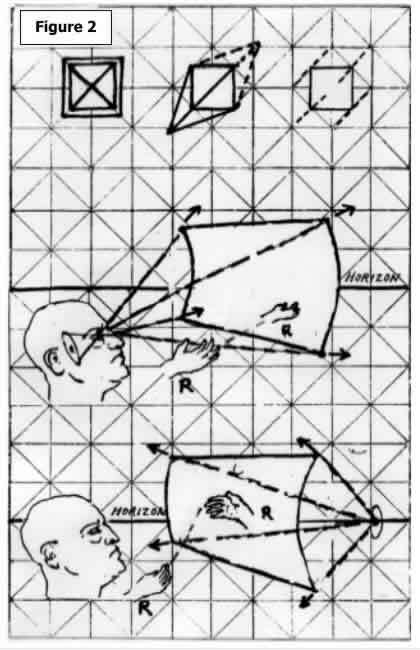 and Pangeometry” including the examples of the two systems of perspective corresponding to the Western and Eastern camera. On one side is the Chinese perspective and on the far right is a Leonardo perspective. In the middle rectangle, which has an X across it, Lissitzky asks where does the tip of the pyramid lie? In the depth implied by the frame or in the viewers space in front of the picture plane. Looking at the two scenarios mapped out in the diagrams (see figure 2. ), we can see the different relationship of the person to the picture plane. We easily imagine a Western oil painting or an Eastern brush drawing that fit these scenarios. If we substitute a text for the picture and examine the position of the organism-person in relation to the implied perspective of the text, we find that the text can generate a totality consistent with either of the two cameras that Lissitzky describes. On the top of Figure 2. are schematic versions of Lissitzky's ideas of the Suprematist perspective. Below is a diagram of the two perspectives generated by the two camera lenses. They more fully demonstrate the relationship of a body's physical orientation to the page, image, or screen of the text. These two scenarios show very different organisations of the world in relation to the viewer/reader as either an object within a perspective system or as the source of a perspective based upon point of view and sphere of influence. This scenario corresponds with the Reading of Experience, where the body is in service of the mind and language is the currency of experience. It runs on the fuel of totality and even on the overthrow of one totality after another. The Claude glass shows how our reading may be bodily transported to different cultural sites, places that culture has determined to be a site. This is an extension of the function of reading without a break with the foundation of reading which rests upon reason and understanding. Ultimately this the hallmark of the western reflective tradition, reflective in its approach to mind and body and their mirrored relationship. The Eastern perspective system begins in the person and extends outward to the screen of the page and projects through it to the surfaces in the world, which it pulls back around the viewer like a bubble of curved space. Here the right hand is directly consistent with our own as if moved forward in space projected in the same orientation we are experiencing without the screen of the page. The Eastern scenario corresponds to the Experience of Reading and the infinite nuance that is the source of possibility. Potential is possibility that remains virtual, which is to say unattached to material and in the realm of idea and reason. Possibility stands in relation to things and events that can be actualised. Lissitzky attempts, as utopian as they were on one hand, were able to actualise an entire trajectory of interest in the integration of bodily and cultural orientation. Arakawa and Gins are the forerunners of this approach to life-in-specific and the integration of aesthetics and ethics. Their work has moved form the disciplinary concerns of painting and poetry to the concerns of city and community. They begin however from a research into what the organism-person has available. The perspective described by the eastern camera and the bodily orientation to the world that it produces is consistent with embodied and self-organising views of our relation to the world. Madeline Gins in her book Helen Keller or Arakawa, develops and enacts the scenarios that Lissitzky describes plus many more. Gins continues the trajectory that Lissitzky starts watching it land in the organism-person. She asks, “might there be an underlying basis for seeing, and, if so, would this be detachable from the actual seeing of things?”(Gins: 1994, p.12) Through this question we can see an approach that unhinges perception by activating nuance that is made perceptible by a person who keeps in practice. There is never an indication that Helen Keller or Arakawa would settle upon any genre of person or any single set of landing sites. Gins then asks, “to what extent does how the body holds itself in relation to the architectural surround correspond with what is thought and felt? (Gins: 1997, p. 173) Exit-genres can only be the practice of these noticings and the incorporation of as many procedures as possible into what we have available. Although the Eastern scenario is more promising simply because it is not in place in the West, the important thing about EXIT-genres is that we can move between these two modes and no doubt many other modes of which we are not yet aware. By becoming aware of the possibilities and the linkages we expand the organism-person into the fullness of its life. The implications of these perspectives of the text are enormous. Not only are they fundamentally different positions relative to the world, (our experience, and direction of action), but they have proprioceptive, perceptual and cognitive ramifications that impact upon Imaginary, Symbolic and Real domains. The relationship of the organism-person to the implied source and direction of the text have largely gone unexamined. Like the Copernican revolution, physical position and spatial orientation reaches far into the site where organism and person are organised. The assumption that “the destination of the mind is freedom” (Lyotard, 1991: 137) implies a totality that seems no more likely to make us free that any other form of designed freedom. Instead the destination might be, as Arakawa and Gins suggest, the mechanism of meaning or even an omnidirectional life. These are pragmatic goals, which can be adjusted. Whereas the adjustment of freedom always requires a much bigger price. The last thing anyone wants to hear at the turn of the 21st century is someone's worldview. Perhaps at the turn of the 20th century that was all that was appropriate to discuss. Genres of the late 20th century emerged as the conditions of a world made presentable through shared codes; they strove to manufacture a common ground. The common sense that arose from the conditions of Modernism was the opposite of sensing and perceiving and was instead a generic form of obedience. Certain rules produce certain results. If it were only a matter of perception, (the glass half empty of half full) we would be back in the situation where the body is in service f the mind. But it is not a case of perception but of activation. Activating the glass in ways that are not only tied to a totalised perception but to nuance allows us access to a sustainable world, granted to Will, Reason, or Idea. By utilising genres otherwise and linking them through EXIT-genres we can produce systems of attention that are focused upon nuance so that possibilities can be configured into us as points-of–readiness. 1.The mechanism of meaning is an ongoing project of Arakawa and Gins since 1963, it is also a way of referring to the organism-person as the site of radical revision of whatever we believe to be unchanging or given about the world itself or our interactions with it. Not only are we each the mechanism of meaning but we are should reorganise the meaning by reorganising our interaction with the world. (See Arakawa and Gins, 1997:43 –107,110,111). 2. Don Byrd in The Poetics of Common Knowledge, observes that “The persistent danger is that humans confuse themselves with their own mechanisms, with their technologies as well as their bodies and souls, which isolated from each another, are also merely machines.” (Byrd: 1994 p.36) Byrd is pointing to the implications of our own abstractions and he is quick to differential between abstraction and generalisation. Abstraction is a form of interaction, which sets specific types of dissociations into place: the dissociation between things and ideas of things, the dissociation between the ideas of things and relationships, and the dissociation between relationships and systems of relations. One of the results of these levels of abstractions is the confusion of ourselves with our systems, in particular the confusion of language and being. 3. Arakawa and Gins are particularly pertinent to the discussion here because of their incessant research on the terms of human interaction. They are looking for approaches to being and becoming a person that do not limit what can be done or what can be made available. They have provided many different tools to figure out what goes on in acts of knowing. The connections they form through their innovative approaches become the tools used when forming the world. 4. .At a 1999 conference on the Humanities in Brisbane, Richard Rorty emphasised his contention that all discourses are stories. He spoke about the failure of analytical philosophy to recognise this, and argued for a transformative philosophy. Rorty suggested that the real value of analytic philosophy and by extension scientific inquiry, was not its ability to add bricks to the edifice of knowledge, but in its ability to transform subjectivity. This transformation happens through stories. Its real effect stems not from its verifiable reality but its affective reality. 5. Take for example the genre anxiety (Lumby), or the creation of new genres such as mystory (Ulmer) not to mention all the genre jumping, beginning with movies like Predator or Dusk til Dawn, or internal genres in Back to the Future or Rosencrantz and Guildernstern are Dead or Alley McBeal or sampling in music, installation and performance in visual arts, and ficto-criticism and creative non-fiction in writing. The desire to find a way out of genres and a way across genres represents the current crisis situation among person, genre and world. The revival of canons however holds the danger of also reviving canonical values, ones to which we should not simply surrender.